Looking for information about a veteran? January 12, 2018 -- Buchenwald Sixer Memorial Project! The Jewish American Society for Historic Preservation is working to erect a memorial to the 6th Armored Division in time for the 75th Anniversary of the camp's liberation. The project is gathering steam, and they are looking for additional supoport (not money). Details at:Buchenwald Memorial Project page. April 30, 2017 -- Ambush and averted massacre in Brittany. American-born Nancy Diraison has family roots in Brittany, and she has been researching the ambush of a Sixer unit which may have averted a massacre in the small town of Chateauneuf-du-Faou ("CDF"). She has compiled her research and her questions into a PDF here: CDF Liberation Narrative. It's a fascinating read. If you happen to have information that can contribute to the project, please contact Nancy directly at . March 26, 2017 -- A new Super Sixth history has been published: Medics of the Sixth Armored Division, by Al Sims, son of Sgt. John Sims, 76th Medical Bn. .
October 26, 2016 -- Photos and scans from the late M/Sgt Ed Knott, 68th Tank Bn..
September 10, 2016 -- The next 6th Armored Reunion is scheduled for September 28-October 2, 2016 in Oklahoma City. SCHEDULE OF EVENTS PDF. July 24, 2016 -- Our re-enactor friends in the Netherlands have started a web site devoted to the Super Sixth: http://www.6tharmoreddivision.com/. August, 2015 -- The reunion crew is going to try for another reunion in about five weeks, but they need to hear from interested attendees NOW. See 2015 Reunion Notice. May 4, 2014 -- Check out the Faces of Margraten project and help them if you can. April 3, 2011 -- Finally! An accurate account of Buchenwald! History author Flint Whitlock has published a new book called The Beasts of Buchenwald, a well-researched book about the hell-hole camp and the sadistic Nazis that ran it. It is unusual in that the author has gone to great lengths to filter out the huge amount of disinformation that typical gets included in anything written about Buchenwald. Highly recommended. November 21, 2010 -- See the new Doing Your Own Research section and "Search this Site" feature to help you find your way through the maze of information available on this site. July 25, 2010 -- You have a friend in Luxembourg. If you have never heard of the .US Veterans Friends, Luxembourg (USVFL) follow this link and learn about them. They are some of our best friends in the world. 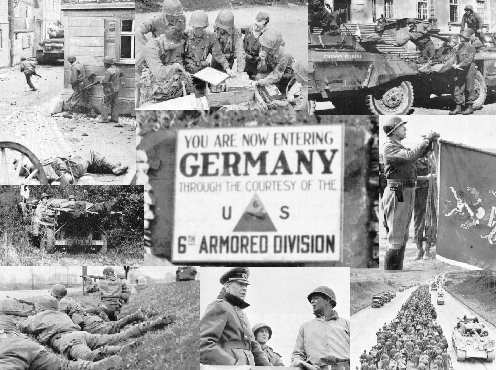 The 6th Armored Division was one of General George S. Patton's famous Third Army divisions during World War II in Europe. Its post-war alumni association disbanded at its final reunion in Louisville, KY in September, 2000. The majority of this time was spent in General George S. Patton's famous Third Army. The 6th Armored was deactivated September 18, 1945 at Camp Shanks, New York. In 1947 the Sixth Armored Division Association was organized to perpetuate the memory of 1,274 fallen comrades, to assist in promoting an everlasting peace, and to serve as a medium of contact among the men who served in the division. Its first reunion was held in 1948 in Louisville, KY. On September 12-17, 2000 its 53rd and final reunion occured in Louisville. You may not recognize the name "Super Sixth", but if you know anything about World War II in Europe, you know about the 6th Armored Division. If you've ever heard about Patton's Third Army, or watched the movie "Patton", or if you've ever heard about the period known as "The Battle of the Bulge", "The Ardennes Campaign", or sometimes just "Bastogne", you know about the Super Sixth. If you've ever heard about "The Breakout" from Normandy hedgerow country a month and a half after D-Day, or Patton's race across France, or the Third Army's 90-degree turn to the north to the Battle of the Bulge, or the crossing of the Siegfried line, or the liberation of Buchenwald, then you probably know more about the 6th Armored Division than you realize. "I think that Patton would have done better if the 4th and 6th Armored Divisions had been grouped together in a single corps, reinforced possibly by the French 2nd Armored Division. These were all very experienced formations and ably commanded...combined as a tank army under one commander, these three armored divisions might well have achieved a decisive breakthrough." He also praised the 6th's performance at Han-sur-Nied, calling it "a dashing coup-de-main". has been reprinted by Battery Press, for the first time in 25 years. The reprint differs from the original edition in only the following details: Chapter XVI, covering the post-war Association, was very out-of-date and has not been included in the reprint; the dust jacket was not reprinted; and the 6th Armd. patch in the front matter was reproduced in black and white, not color. They are selling this book for 49.95, plus shipping and handling. Make checks payable to: George F. Hofmann, Ph.D. This is new book featuring General Grow and a few units from the 6th Armored Division, just published (June 2006) by the University Press of Kentucky. Available from the author at $39.00 including postage and handling (a 20% discount). See ordering instructions above. Edited by George F. Hofmann and Gen. Donn A. Starry, this book won the Army Historical Foundation's distinguished book award for 2000. It is the only complete history of U.S. armored forces from the advent of the tank in battle in World War I through the campaign to drive Iraq out of Kuwait in 1991. $28.00, including postage and handling. See ordering instructions above. George F. Hofmann's meticulously researched and documented retelling of the General Robert Grow's tragic court martial in 1952. An indictment of army politics and corruption of the military justice system. $21.00, including postage and handling. See ordering instructions above. 68th Tank Battalion -- Distinguished Unit Citation, for Landroff, France (Company A cited), and for Han-sur-Nied, France (Company B cited. French Croix de Guerre with Silver Gilt Star for Han-sur-Nied, France (Company B cited). 69th Tank Battalion -- Distinguished Unit Citation, for Bastogne (Company C cited). 9th and 50th Armored Infantry Battalions -- French Croix de Guerre with Palm, for Brest, France. 212th Armored Field Artillery Battalion -- French Croix de Guerre with Silver Gilt Star, for Lan Froicourt, France. 231st Armored Field Artillery Battalion -- French Croix de Guerre with Silver Gilt Star, for Han-sur-Nied, France. 86th Cavalry Reconnaisance Squadron -- Distinguished Unit Citation, for action at Eder River, Germany (Troop D cited), and Prum River, Germany (Troop A cited). 25th Armored Engineer Battalion -- Distinguished Unit Citation, for action at Wardin, Belgium, and Prum River, Germany (3rd platoon, Company C cited). 777th Anti-Aircraft Artillery Battalion -- French Croix de Guerre with Silver Gilt Star, for Avranches, France. Rank and organization: Corporal, U.S. Army, Company C, 603d Tank Destroyer Battalion. Place and date: Near Arloncourt, Belgium, 15 January 1945. Entered service at: St. Ansgar, lowa. Born: 20 May 1909, Rock Township, Mitchell County, lowa. Citation: He displayed conspicuous gallantry in action. His platoon, in which he was a tank-destroyer gunner, was held up by antitank, machinegun, and rifle fire from enemy troops dug in along a ridge about 200 yards to the front. Noting a machinegun position in this defense line, he fired upon it with his 76-mm. gun killing 1 man and silencing the weapon. He dismounted from his vehicle and, under direct enemy observation, crossed open ground to capture the 2 remaining members of the crew. Another machinegun, about 250 yards to the left, continued to fire on him. Through withering fire, he advanced on the position. Throwing a grenade into the emplacement, he killed 1 crewmember and again captured the 2 survivors. He was subjected to concentrated small-arms fire but, with great bravery, he worked his way a quarter mile along the ridge, attacking hostile soldiers in their foxholes with his carbine and grenades. When he had completed his self-imposed mission against powerful German forces, he had destroyed 2 machinegun positions, killed 8 of the enemy and captured 18 prisoners, including 2 bazooka teams. Cpl. Beyer's intrepid action and unflinching determination to close with and destroy the enemy eliminated the German defense line and enabled his task force to gain its objective. Hey, this site looks like it was created in 1996 with Notepad! Well, that would be because this site WAS originally created in 1996 with Notepad. This is an all-volunteer, spare-time activity. Family & job take priority over upgrading the appearance of a free, personal web site. If I'm going to devote four hours to this site on a weekend, and I can either upload a new scanned document, or make the home page pretty, the content will win every time. When (if) I retire, I'll devote some time to the appearance of the site. In the meantime, benefit from the content here, and try to ignore the retro ambience. Where'd the info about the books go? I've moved the publications information to a separate page so that this page would load faster. If this is your first visit to the Sixth Armored Division home page, please spend some time and explore. I've put a lot of information on this site: maps, excerpts from official histories, personal stories from Division veterans, etc. Excerpts from Combat History of the 6th Armored Division by William Rutledge. History of the 212th AFA in the ETO (European Theatre of Operations). Unit History, 68th Tank Battalion. Seek, Strike, Destroy, History of 1st Platoon, Recon Co., 603rd Tank Destroyer Battalion. Personal Stories from veterans of the Super Sixth. Color campaign map of the 6th Armored. Medium-res copies available for downloading. Information about the 212th AFA and 6th Armored Division veterans' associations. Unofficial Home Page of the 212th AFA. Notes about Division Commander Maj. Gen. Robert W. Grow (from 212th AFA History). "There is one great thing that you men will be able to say after this war is over and you are home once again. You may be thankful that twenty years from now when you are sitting by the fireplace with your grandson on your knee and he asks you what you did in the great World War II, you won't have to cough, shift him to the other knee as say 'Well, your granddaddy shoveled sh*t in Louisiana.' No sir, you can look him straight in the eye and say, 'Son, your granddaddy rode with the great Third Army and a S.O.B. named Georgie Patton!' "
Version researched by Charles M. Province for "The Unknown Patton". NOTE: Remove the question mark and use common sense when reconstructing the email address below when sending mail. son of 212th FA veteran Lt. Arthur M. Frederick, deceased.